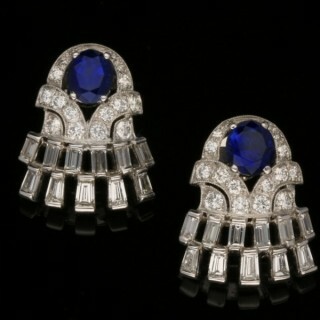 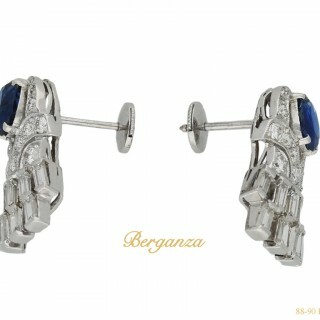 Vintage sapphire and diamond earrings. 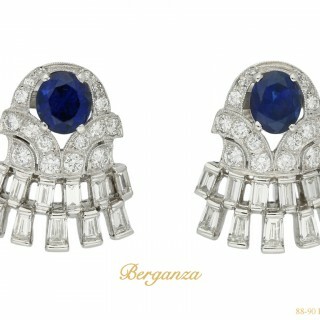 A matching pair, each set with one oval old cut natural unenhanced sapphire in an open back claw setting, two in total with a combined approximate weight of 2.20 carats, and eleven rectangular baguette cut diamonds in open back half rubover settings, twenty two in total with a combined weight of 1.30 carats, further set with twelve round brilliant cut diamonds in open back grain settings, twenty four in total with a combined weight of 1.00 carats and four round eight cut diamonds in open back grain settings, eight in total with a combined weight of 0.16 carats. 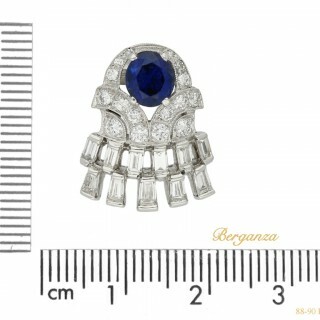 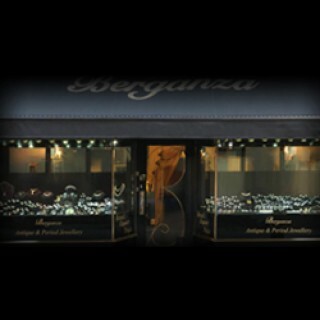 The combined approximate diamond weight is 2.46 carats, to an openwork cluster design with millegrain decoration, intricately pierced gallery and shaped backholing, fitted to reverse with a secure post and disc fitting, approximately 2cm in length. 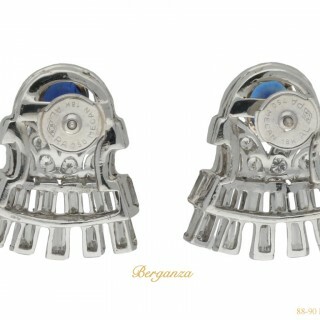 Earrings tested 18 carat white gold, discs marked 18 carat white gold, circa 1960.